Australia's Counterterrorist capabilities have been completely revamped since 9-11. Our capabilities now include both SASR and Commando based Counter Terrorist (CT) teams on the West and East coasts of Australia respectively. This is a departure from previous policy where SASR had exclusive responsibility for this mission and reflects the new SF options policy makers have in the Commando regiment. This broadening of responsibility is largely due to the SASR's need to focus more on LRRP and to redistribute the burden of SF operations among the redefined Australian SF community. Personnel for TAG-East are drawn from the Commando regiment, 4RAR. Recruiting procedures for this process are not publicly released in any great detail but it is generally understood that every Commando can have a go at it if deemed suitable and of sufficient tenure. It is also believed that staff from some of the CDT teams have joined both this and the TAG-West teams to aid in the development of their respective maritime capabilities. Click here for article. TAG-West is the SASR's TAG team and as the name suggests, has responsibility for the West coast where the SASR is based. This team has been around since 1978 and has, until 2002, had nationwide responsibilities for counterterrorism. The TAG teams are known to cross train with the world's best CT teams, including Delta, SEAL Team 6, SAS, and other European teams. Their arsenal includes the standard range of weapons available to CT and SF groups including Steyr rifles, the M-16 range of weapons including the more modern variant the M-4, the HK range of weapons and an assortment of hand guns and sniper rifles including SIG Sauer's, Browning 9mm, 7.62 Galil, HK PSG-1, and the Parker Hale 82 to name a few.Both teams train to the highest international standards in Method of Entry Techniques and other assorted CQB specialties. 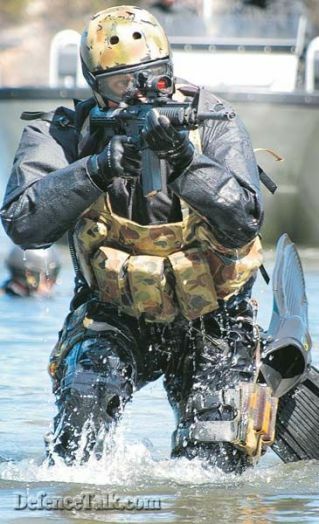 While the SASR's primary war role is special reconnaissance and "special warfare" (raising and training indigenous forces) the Commandos role represents a more aggressive element of the Special Operations Command, with a high level of emphasis on maritime and open ocean parachute inserted direct action missions, similar to the US Navy SEALs. Consequently both the SAS and Commando based TAG teams are exceedingly well placed to perform their mission.Australia has excellent facilities for TAG training, including a new Military Operations and Urban Terrain complex at Sydney's Holsworthy Barracks. An Aircraft mockup range, and a new water operations training centre have also been added to the barracks training facilities to further augment its role as a special forces base. 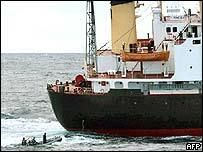 TAG Teams saw active duty in April 2003 with the interception and boarding of a North Korean Vessel known to have been trafficking Heroin to Australia. Media reports have it that a combined SASR/Commando TAG team raided the vessel by helicopter and zodiac insertion in "treacherous seas". Launched from the HMS Stuart, the combined Ship Underway Recovery (SUR) team was called in after a number of unsuccessful boarding attempts from Police launches by police and customs officials. The SF teams then moved directly to the bridge and control spaces to secure prisoners and the controls of the ship so that more naval personnel could steer her to friendly ports. The vessel had been the subject of a surveillance operation (and then five day open seas chase by the Navy) by Australian Federal Police and was video taped unloading 50 Kilograms of Heroin onto a dinghy. TAG personnel are trained in the same advanced insertion techniques that characterise both Commando and SASR capabilities including HALO, heliborne, SCUBA, and zodiac insertions - though this point is fairly obvious since personnel for TAG are drawn from these two units. The successful development of a Commando TAG capability was nicely demonstrated by the aforementioned DPRK (North Korea) vessel raid.